We offer a quick and inexpensive possibility to assemble your tailormade coaxial cables. Thanks to our long lasting experience in this area we are familiar with assembling all established coaxial and semi-rigid cables and are able to offer you a strong partner for your concerns. Our investment in modern machines gave us the possibility to work more accurate and also optimize the working time to keep our prices low. 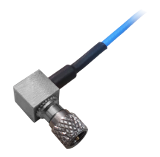 We would be glad to send you an offer for your specific cable assembly with the requested length and coaxial connector(s). Special options like taper sleeves or labeling of the cable are always possible. Each cable is tested for short circuits and open loops before delivery, other tests like VSWR or transmission loss can be done on request. In this case a correspondent test protocoll would be provided.